In exploring the lives of others, what are the virtues of an outsider’s position? What did the participants hope would result from their share in this common ritual? At the least, they knew themselves to be partnered in an open-ended but definite transaction. Dutch photographer Dana Lixenberg’s latest book Imperial Courts (2015) is a collective portrait of the inhabitants of a housing project in Watts, Los Angeles. The work began in the wake of the riots that exploded in April 1992 following the acquittal of four white police officers who were filmed beating Rodney King. By coincidence, Lixenberg completed the work in spring 2015, in the full heat of protests in Baltimore that followed the death of Freddie Gray from a spine severed while in police custody. In the book, as Lixenberg gradually introduces a large cast of individuals, we are struck by the complexity of reckoning with time mapped across faces over so many years. Imperial Courts grants us entry and proximity as outsiders to a small, neglected, inner-city community, raising a question addressed by the work itself, but pertinent to much contemporary photographic practice: What are the virtues of a photographer’s position on the outside of a world looking in? 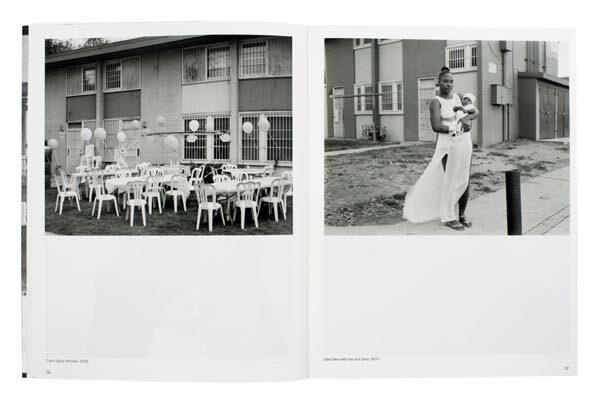 With the exception of the book’s cover image, showing the extension of a highway intersection that opens onto Imperial Courts, Lixenberg made every photograph within the housing project. Across 343 pictures, she patiently tracks multiple generational changes: parents age, children are born, and daughters become grandmothers in the span of these pages. Lixenberg first photographed infant Dee Dee in 1993, wearing patterned braids and perched on her father Chin’s lap, then as an adolescent in 2008, and finally as a mother in 2013, proudly holding her infant son Emir. We see China, her hair neatly bound up in rollers in 1993, and her elegant daughter Keisha some seventeen years later, now mother to an infant Romeo, and sister to an adolescent Tye, whose oversized earrings hark back to the fashions of China’s youth. Lixenberg’s photographs issue from the lengthy, purposeful collaboration required by a 4 x 5 camera. As such, they place particular emphasis on the formal presentation of the self. These individuals are intensely aware not only of the camera, but also, seemingly, its foreignness to their community—and, by implication, the foreignness of the photographer herself. In portraits of Trouble (2009), Jeff (1993), and Marylee (2010), we sense a relationship to Lixenberg shaped by circumspection and pride, which is complicated as Jeff reveals a small measure of sadness, or as J-50 warms to the camera over an interval of fifteen years. Lixenberg’s rejection of the spectacle of ruination following the riots of 1992, and her use of portraiture to record changing American families, reflects her disavowal of the reflexive linkage of blackness with crisis. This choice does not redress the innumerable daily injustices of white supremacy, nor could it. But Lixenberg’s portraits underscore the value of individual and communal life, even as such life plays out in the abandoned urban zones that undergird economic “progress” in the United States. Imperial Courts momentarily closes the symbolic and physical distances inscribed in the landscape and culture that it traverses. It is work possessed of a degree of lucidity, specificity, variety, and beauty that is the equal of the many people depicted. While Lixenberg initially traveled from Amsterdam to Los Angeles to make portraits of unfamiliar people, her compatriot Petra Stavast turned to her upstairs landlady in Amsterdam, refusing the stable comfort of anonymity with a neighbor for the volatility that accompanies a more intimate relationship. Where Lixenberg became involved in the history of a foreign community, in Ramya (2014), Stavast immersed herself in the life of an equally unfamiliar but proximate stranger—each artist was thus drawn into reciprocal and changing relationships with others by the inherently social nature of photography. Stavast’s desire to make portraits was the catalyst for her decade-long relationship with Ramya, the eponymous subject of her latest book. In it, she sketches the fascinating shape of Ramya’s life through an array of photographs, video stills, documents, and transcribed conversations. In Stavast’s early series of portraits, Ramya rejects any formal etiquette, while accommodating the camera’s presence with a mixture of bemusement, boredom, disbelief, and disinterest. While there are occasional intimations of mutual curiosity in these pictures, the cumulative effect of the series underscores the slippery imprecision of a portrait’s static address. Ramya is certainly aware of the camera, but apparently habituated to its presence. As she becomes successively less guarded, she reveals her mercurial, complex charisma. The book is marked by the somber fact that Ramya died during the making of the work, and its multi-layered composition results from the imperative Stavast felt, after her death, to delve deeper into the record of Ramya’s history. Thus Stavast discovered Ramya’s membership in the Rajneeshpuram commune in rural Oregon in the early 1980s, and that prior to this, Ramya had been known by another name. In stills from Ramya’s Oregon video footage, Stavast searches out the woman she knows to have been present, but can no longer reliably identify, selecting possible candidates from the crowd, and enlarging them to a point of degradation at which the pattern of a dot screen is legible, as if to revivify the gene of a past sealed away within the surface of the image itself. Ramya underscores the unpredictable nature of relationships facilitated by photography, but also the closeness that can come from the repetitive act of portraiture. Across the book’s pages, we are compelled to reckon with the mysteries of those people who are momentarily closest to us, and we are left with the compelling imperfection of memories and images. Amongst Ramya’s documents from her time in the commune are mental exercises on redefining the self, in one of which is written, “YOUR REALITY IS CREATED BY YOUR MIND!” These mantras speak to a faith in mental images as tools for creating unimagined futures. Such notions are taken up by Max Pinckers in his self-published book Will They Sing Like Raindrops or Leave Me Thirsty (2014), which explores forbidden romantic love within the Indian caste system through its relationship to the imagery of Indian cinema. Pinckers, born in Belgium and raised in Asia, photographed couples who hope to transform tradition by ignoring caste restrictions on marriage. Thus the love of his protagonists is a projection of faith in the prospect of change held over against an inflexible past. Will They Sing Like Raindrops retains a buoyant optimism in the face of the violent threat of repression to which these couples are all too frequently exposed, intimated in a photograph of bloody fingers or in gruesome news clippings scattered pointedly throughout the book. Pinckers’s recurrent use of what western art photography calls the “tableau” derives from his fascination with the populist force of Indian cinema, whose melodramatic affect has its roots in pre-medieval theories of Indian theater. In his overtly staged melodramas, couples embrace alongside tumultuous seas beneath patterned fabrics “lit” by the mirrored glare of artificial light, or fling forbidden missives across rooftops above houses whose walls separate them from one another. Pinckers’s portrait of a star-gazing woman regally smoking atop a four poster bed recalls Larry Sultan’s pictures from The Valley, and speaks not only to the currency of cinema’s hold on human imagination, but also to the irrepressible yearnings unchained by the image’s capacity to enlist us in willful dreaming. In this way, Pinckers’s work reveals the disjuncture between the freedom of images and the rigidity of political will. Lixenberg, Stavast, and Pinkers’s books deploy an array of forms and strategies that seek to contextualize the people they depict, and to ground us in the individual and communal worlds their work outlines. In contrast to the pejorative books I explored in my essay “The Lives of Others,” published on this site in October 2015, these works reject the facile tropes common to deterministic treatments of the Other. Moreover, each of these three artists have rejected the liberal strain of determinism, which seeks to proscribe artists from making certain work on the basis of their ethnicity, gender, nationality, or relative wealth. Such proscriptions (commendably) attempt to mitigate the effects of real systemic inequalities, but they essentialize these categories as absolutes in the process. Stanley Wolukau-Wanambwa, a photographer, writer, and editor of The Great Leap Sideways, is a faculty member in the photography department at Purchase College, SUNY.